It seems like our Friday art lessons are becoming Friday’s nature studies. When I began doing art with the kids, my intent was to get them up and running with some basic drawing skills and begin official nature studies much later, maybe in the spring. 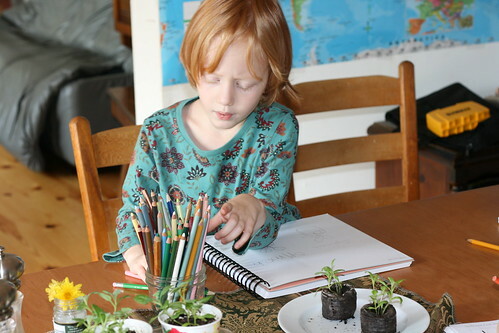 However, we seem to lean toward nature studies in our artistic endeavors and the kids are loving it —– funny how many of our best homeschooling times just unfold naturally without a lot of planning from me. It is those intensely planned out lessons that I struggle with and that seem to fall flat. I have some lovely broccoli and spinach plants I sprouted from seed. My grand idea is to see how long I can coax veggies from my plants this winter. Hopefully, Sid will rig up a contraption to keep my plants from freezing and keep them bearing. 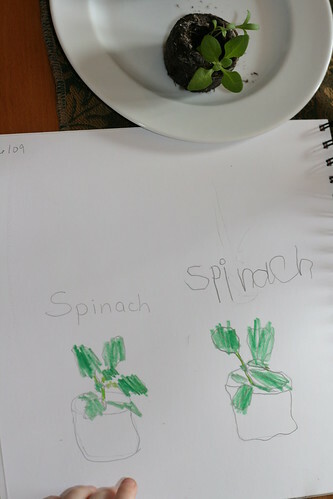 But for today, the spinach plants became the focus of our art study. For Prairie, I did a quick sketch of the spinach plant and wrote “spinach.” She traced the drawing, the word and colored it. I thought that she might develop a dependence on me and not ever want to draw anything independently. But thus far, she draws more than ever, independently, and I can usually tell what she is trying to draw. I don’t like to employ this method for Rachel, however, because her personality would likely cause to become dependent on me. So for this girl, I sat beside her, talked about where to start and the shapes. I drew the first leaf on the left side of the paper and directed her to draw on the right side. We continued this way, leaf by leaf or stalk by stalk until we had the whole spinach plant. I dated the page and let her color both our plants.